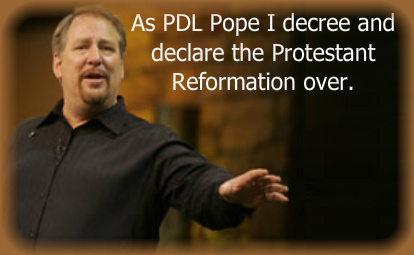 SADDLEBACK CHURCH OF RICK WARREN CANCELS "CHRISTMAS SERVICE"
Apprising Ministries has long been a leading critic of the semi-pelagian (at best) doctrine of Purpose Driven Pope Rick Warren. In articles like Rick Warren And Teachings Of Demons I’ve also clearly documented his sinful ecumenicism as well. Of course that’s merely one of the fruits within apostatizing evangelicalism because of its foolish fascination with corrupt Contemplative Spirituality/Mysticism. In a rare move, the 20,000-member Saddleback Church in Orange County is canceling all of its worship services during the second weekend in December in order to help facilitate a huge neighborhood volunteer opportunity. In its 31-year history, the megachurch has canceled weekend services less than a handful of times, according to Warren. On the positive side, at least this will be one weekend the Saddleback faithful would have the chance to avoid the Bible-twisting of Rick Warren and fellow man-pleasing Church Growth Movement pals like Bill Hybels. RICK WARREN TWEETS A MESSAGE TO KEN SILVA?